Secret Pal Gifts and Swaps This is the beautiful bag I recieved from Lynne Quinn in her Christmas Swap. To see more of the Christmas swap follow this link ! I received this beautiful necklace from my Secret Pal Anne Fresica. It reminds me of a sea urchin. I love it and wear it all the time. It's like nothing I would make for myself, that's what I love about it. I made this bag for my Secret Pal, it's an original design of a blue poppy, done in 14 seed beads and 14 hexes. 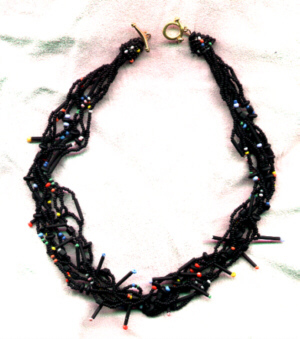 It is the first design that I ever took down into the fringe. It was great fun to do. I was inspired by Marylyn Leston's Morning Glorious Bag. The bag has a poppy on both sides and is double fringed. The strap is Kathy Rice's diamond chain. Instructions for the diamond chain This is my first attempt at a votive candle holder. I made it for the Surprise Swap. 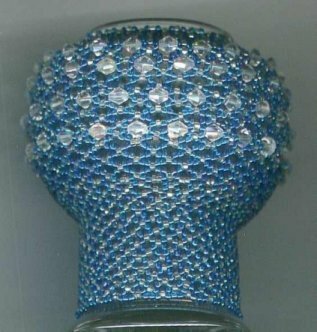 I started at the bottom with three drop peyote lace, and increased and incorporated faceted crystals, then decreased back to three drop peyote lace. It was hard to resist lighting it, to see what it will look like with candle light shinning through it!! My first Christmas Ornament done for Lynne's Christmas Swap. It is the design from Bead and Button, done with twisted gold bugles, purple and gold tri-cut nines and purple Austrian crystals. It was scanned with my scanner lying on it's side, and the scanner worked great, This amulet bag is for my Secret Pal in the amulet section of Lynne's Christmas Swap. 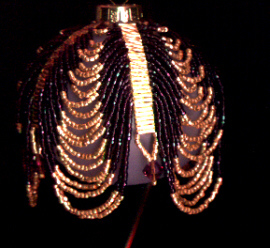 The bag is done in three drop peyote lace using size nine tri-cuts. 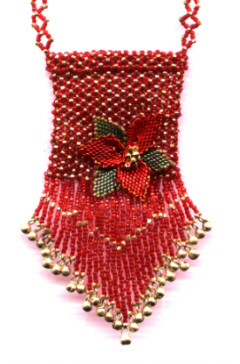 The Poinsettia was done using Maria Oldring's Peyote Leaves found under beading patterns here. The strap is Kathy Rice's Dimond chain,a quick, beatuiful bag strap that is both delicate and strong. 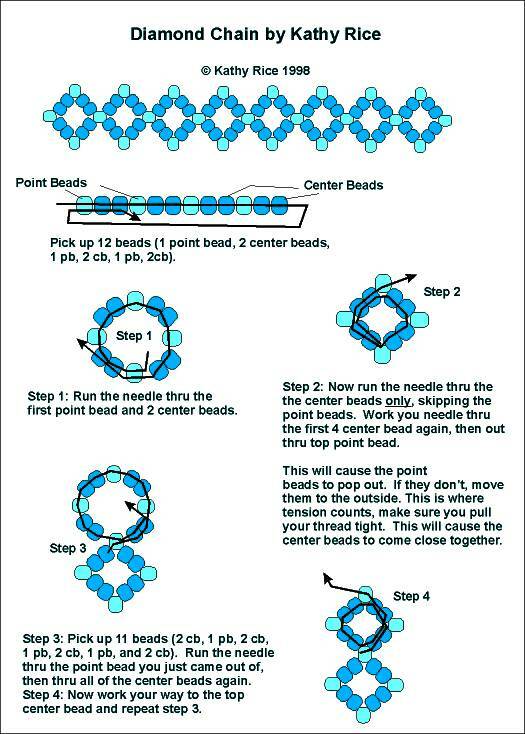 Instructions for Kathy's chain.